Gate One Builders had the honor and pleasure to collaborate with Hammond Wilson Architecture on a wonderful waterfront estate. The team of creative professionals at HW produced a wonderful design and supported our construction team throughout the entire construction process. 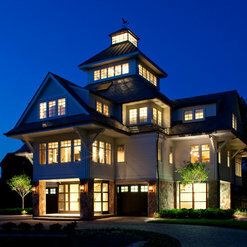 I would leap at the chance to work with one of Maryland's premier architectural firms. Our project started in Nov. 2015. 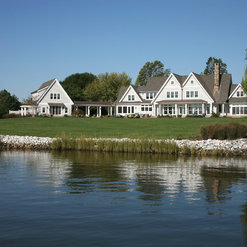 We live on the waterfront in Annapolis, MD and our lot sits inside several different zoning restrictions. The full renovation embodied two challenges, first to take advantage of the remarkable views, and second to integrate three disparate buildings that were poorly connected - those various renovations spanned from 1922, 1974, and 2003. The Hammond Wilson team approached our project with the resources and experience that you would expect from only the largest architectural firms. They guided us during the myriad of decision points, and ensured that we stayed with the period and feel of the farm setting. Their ideas and construction experience was critical to helping us stay on budget and time. The end results are a home that has become an estate. Long water views exist from every room in the house, each space is highly efficient yet private and comfortable. The entire house flows from one end to the other offering all of our family a place to relax. We are incredibly proud of what our team has accomplished. 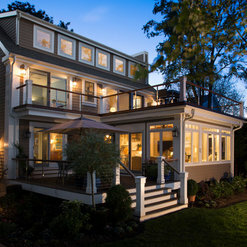 Leo Wilson and entire staff did a amazing job designing and assisting us during our waterfront home renovation project. HW expanded our views and maximized the natural sunlight entering our home without changing the architectural lines. Project was 1500ft encompassing all 3 levels. Renovations can be nightmares! Especially on waterfront properties. HW’s local knowledge of the permitting process made the entire project painless. HW’s budget numbers were perfect and his firm does not “milk the cow” very consistent staff and billing policies. When we purchased our home in Annapolis we asked the realtor to recommend an architect to help us with the extensive and complex changes we knew the house needed. She referred us to Hammond Wilson and it was the biggest favor that she could possibly have done for us. We worked closely with Leo Wilson and other members of his team to clear government hurdles, resolve technical issues, achieve our design goals and guide us to award-winning completion. Another big contribution to the project, specifically by Leo, was assistance in selecting a general contractor who also more than surpassed our expectations. We bought a beautifully situated but horribly dated waterfront house, and Hammond Wilson turned it into a home that we love. We came to Leo and his team with a lot of ideas -- way more than we could ever use. They helped us sort through them, and really got us to think about how we wanted to use the house. Their creativity in turning all of the ideas and possibilities into a plan that worked and a look that really resonated with us, was just amazing. More than that, they are fun to work with. True professionals throughout the entire process. They get things done and have a great way of making you feel comfortable with what are really big decisions. My husband and I have worked with Leo Wilson and his team on three different projects over the last nine years. One was a complete home re-design, one a smaller home-addition project and the last one was somewhere in the middle, but had some very complicated design aspects. On all three, we absolutely loved the results. Leo's designs have a timeless quality, but are also innovative and visionary. He was a pleasure to work with, listened attentively to our needs, and sought out creative solutions. Leo was always professional and worked very well within our team of designers and the general contractors. We highly recommend him and the team at Hammond Wilson. Designing and building a custom home is a very long process. From the start, we always felt like Leo and his team were listening to us. And that held true to the very end. We love our home and the design suits us perfectly. We love all the details that make it ours. When there were bumps in the road in the construction process, we were confident that we had the best possible advocates in Hammond Wilson. Can't say enough good things. 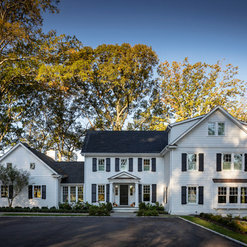 Hammond Wilson's passion, honesty, vision and caring approach to our home renovation were truly unparalleled. Their solutions to what seemed like impossible architectural challenges were thoughtful, beautiful and functional. We know and have worked with many architectural firms, but not one quite as exceptional as Hammond Wilson. We worked with Hammond Wilson on our home, originally built in 1836. The property had 7 total owners and had been renovated quite poorly over the past 175 years. It's layout, given the size of the house, no longer made sense. Flow from room to room was severely impacted. 11 foot ceilings were hidden by drop ceilings. The 3 acre estate could not be seen from indoors. Hammond Wilson corrected the flow of rooms by establishing a new stair structure and central hallway. The floorplan was reinvented to create a 40x40 great room with a kitchen to suit. Coffered ceilings were designed to center a grand fireplace. Multiple sets of French doors were leveraged on all levels. Through those doors, and the use of multiple, bay windows, the outside was brought in. The result is a timeless design that brings the grandeur of the 1830's back, with the outside flowing in. The sunlight is breathtaking and the color green floods the indoor experience. Cannot thank the team enough. From the front desk to the project architects on-up, everyone was responsive, on point, and artfully intelligent to work with. Highly recommend this group if you are looking for a collaborative team that really gets the art and importance of making something wonderful, long-lasting and brand new again while keeping mindful of what the architecture once was and paying homage to that concept throughout the process. Hammond Wilson listened carefully to what we were trying to achieve in renovating an existing house. The level of understanding of our desired style and living requirements was outstanding. They seamlessly integrated new design elements that met and sometimes exceeded our expectations. Their management of the project facilitated a smooth, enjoyable process to completion. We love the way the house flows and takes advantage of the beautiful water views from every room. A pleasure to work with, Hammond Wilson is not just another skilled professional firm, their staff is wonderfully warm and personal. With an unmatched legacy, Hammond Wilson Architects continues to be the enduring cornerstone for the region's design community. Led by Leo Wilson, the incredible team at HWA has the ability to apply their unique talents to luxury residential and commercial projects of all sizes, with work showcasing their signature understanding of scale, materials, and site elements. Pyramid Builders is fortunate to have worked with Hammond Wilson Architects on dozens of incredible projects, literally spanning decades. As a builder, working with the HWA team always provides a consistent and seamless process … from clearly articulating a client's vision, to providing well detailed construction documents, with incredible support to the entire build team during construction. We always know that when working with Hammond Wilson, projects are developed to a very high level, and expectations are always exceeded. We look forward to working with Hammond Wilson Architects at every opportunity. Commented: What brand and color of shingle?This is a 50 year asphalt roof by Heritage Tamko -- the color is Rustic Slate. 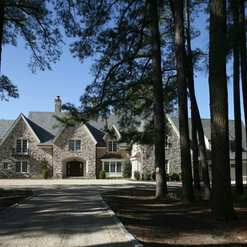 http://www.tamko.com/ResidentialRoofing/LaminatedAsphalt/Heritage Best of luck with your project! Commented: How much is the square footage of the home please.The size of this home is in the neighborhood of 4,500 square feet. Commented: hello, what siding color plzSorry we're not able to help -- as this was a renovation, the exterior color was custom mixed to match the existing exterior.